In a surge of optimism the other day, I signed up to review a cookbook. This will be so much fun! I thought. I mean, look at the author on the cover – doesn’t she look fun? I think at some level I imagined her bringing the cookbook to me – you know, in person – then hanging out to make me some recipes. She’d do the cooking, I’d pour wine. We’d take a selfie and post it all over the interwebs with lots of emoji and exclamation marks. It would be lovely. To this point, the only intersection between my writing and my cooking occurred in the third chapter of A MAZE OF GRACE, where I confess that in my first year of marriage, I cooked every meal we ate by sautéing various hunks of meat in olive oil and butter. Every. Single. Meal. (except, of course, those involving sandwiches or cereal). There was no baking. No grilling. No broiling. I don’t remember ever opening the oven. That was the year we each gained 25 pounds, and learned that Mylanta gel caps are the best antacid on the market. But that was then. I’m better at cooking now–I even use the inside of the oven :) And as I try to grow in this area of life, I have the opportunity to support the career of another author while doing something that will likely provide any number of “memorable” (read: highly comedic) moments. That’s not a bad deal. How would YOU review a cookbook? What information would you find helpful? Obviously I’m not going to cook ALL the recipes, but I’ll try a bunch of them. How would you choose which to try–would you go for the ones you’re pretty sure fall within your skill and taste range (there’s a whole chapter devoted to sandwiches! ), or would you try something that seems more difficult and/or questionable (Caramelized Onion-Tomato Jam, anyone???) and see what happens? Tell me about the review that would help you decide if this book is for you. 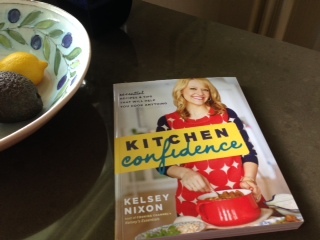 This entry was posted in Books and tagged Kelsey Nixon, Kitchen Confidence on August 4, 2014 by Trish Ryan.